Verus LLC has been selected by The National Law Journal readers as one of the top two firms in their “Claims Administrator” category. 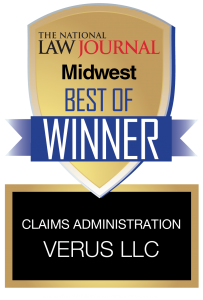 Verus LLC is pleased to announce that the readers of The National Law Journal have voted Verus to be among the top two Claims Administrators in their annual “Best of the Midwest Reader Rankings” survey. Readers were asked to cast votes on service providers covering diverse aspects of the practice of law. “We are thrilled to add this honor to our growing list of accolades. That clients and peers think so highly of our work is a testament to the dedication and talent of our team. They work hard to deliver the quality work product and attention to detail our clients have come to expect. We are fully committed to supporting our clients as they manage their complex mass torts practices and to be recognized for this dedication makes the effort worthwhile. ” said Mark Eveland, CEO, Verus LLC. Since 2003, Verus LLC has processed over 5 million asbestos personal injury claims and has billed, collected, managed and disbursed over $6 billion. Leveraging this experience, Verus has developed a broad range of services and technology to assist firms with the resolution of complex disputes. Our team of skilled professionals offers a full range of litigation support services in areas such as analytics, medical review and case management, claims administration, data management, e-discovery, damages modeling, liability forecasting, accounting and compliance, and process and systems improvement.